"Experience other cultures through fascinating items such as the hookah!" 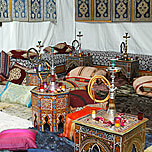 Experience other cultures through fascinating items such as the hookah. A hookah bar or hookah lounge offers the opportunities to experience a traditional Middle Eastern water pipe, so sit back, relax, and breathe deeply. Once you enter the doors of Jaba Kabob & Grill, you’ll fall under its spell. A charming Middle Eastern restaurant located in Philadelphia, Jaba Kabob & Grill specializes in traditional Middle Eastern cuisine, as well as new American favorites. Their menu includes a full range of tempting items made with only the freshest ingredients.